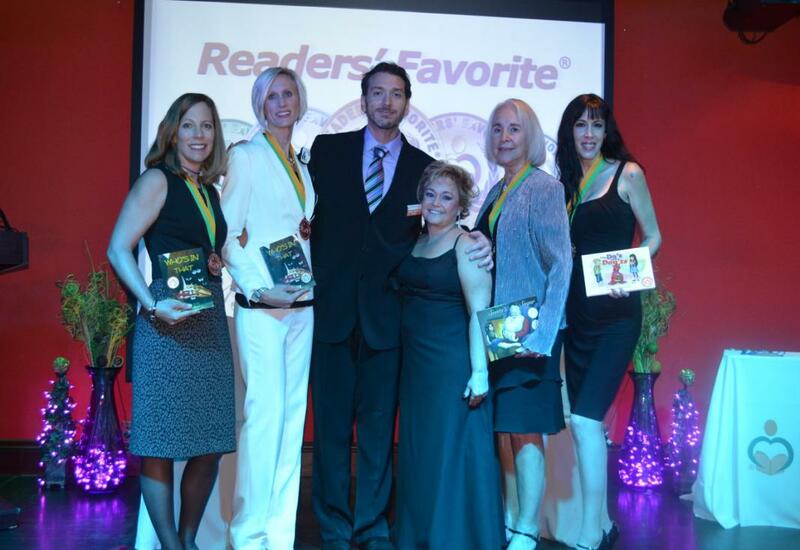 Founder/CEO Debra Gaynor along with James Ventrillo and award winning authors. —Having grown exponentially over the past 5 years, Readers Favorite International Book Awards Ceremony welcomed over 250 authors and guest speakers from the literary community in Miami on November 23rd for what concluded to be a night of success. Coinciding with the 30th Anniversary of Miami Book Fair International, Readers’ Favorite International Book Awards continues to be one of the largest award ceremonies for authors worldwide. Debra Gaynor preceded the ceremony by interviewing inspirational celebrity speakers who nonetheless have been gold medal awards winners or finalists. The contest recognizes 100 different genres which categorize the thousands of submitted publications. Each submission competes against those within its genre and each is awarded on four different levels; Gold, Silver, Bronze and Honorable Mention. Submitting authors range from independent authors and small publishers to industry giants like HarperCollins and Simon & Schuster. I interviewed celebrity guest speaker Eriq La Salle, renowned TV and film actor, director and producer- best known to worldwide audiences for his portrayal of Dr.Peter Benton on the hit TV show E.R, his role next to Eddie Murphy in “Coming to America” and Robin Williams in “One Hour Photo,” and now a gold medal award winning author for his book “Law of Depravity.” This intense debut novel will have you pondering the fine line between right and wrong, between sanity and insanity. Expect to have your world shaken when you read “Laws of Depravity,” said book reviewer Lee Ashford. “Most movies are not as good as the books. There is something that is lost in translation. Because of my background as an actor and director my concept is to write in a more cinematic way and create something that hasn’t been done yet,” said Eriq La Salle when asked on his debut as an author. Another award winning author and illustrator who I had the pleasure of interviewing was Mark Wayne Adams, former Disney Artist. “Jilli, That’s Silly! : A Story About Being A Girl”, authored by Christa Carpenter and illustrated by Mark Wayne Adams received a gold medal award. Mark worked for Sea World Disney for over 6 years as a director and manager. He then applied his business skills and opened his Illustration Company. – “Then later on because I had management experience I realized I was maintaining the entire publishing project so from that point forward I decided to create my own label,” said Mark. 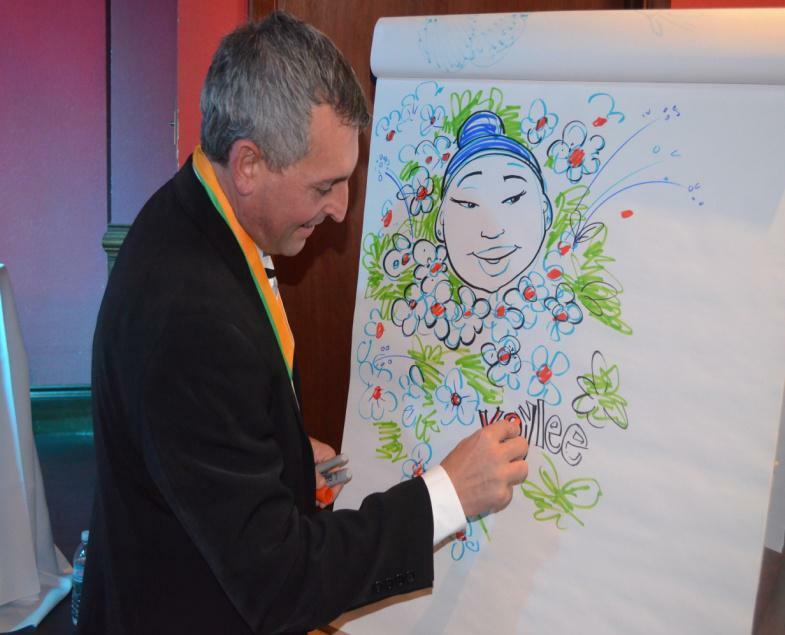 Mark Wayne Adams as he illustrates a guest in the audience into a cartoon drawing. Mark has illustrated over 32 children book, published 12 and is currently working on 4 books. Mark is the award-winning illustrator and publisher of Christa’s series and the Best Fairy Books series (“The Belly Button Fairy,” “The Fart Fairy,” “The Knot Fairy,” and “The Sock Fairy.”) “Christa and I are currently working on our 5th book from our best fairies book series,” said Mark. Their new fairy already named the “Freckle fairy” will be released in 2014. Renowned publishers such as Random House, Penguin and Harper Collins continue to rave about Readers’ Favorite. The company received awards including Best Websites for Authors and Honoring Excellence from the Association of Independent Authors (AIA). Having earned such high honors and respect from publishers and readers around the world, Readers Favorite has recently also gained the attention of the film production industry and Hollywood. “I’ am very much honored and grateful to receive this award,” said Manny who is currently working on his third book in the FH series. Pacheco’s book series have been added to prestigious locations as the libraries of the Academy of Motion Picture Arts and Sciences, American Film Institute, Screen Actors Guild Foundation, and Writers Guild Foundation; and Hollywood Heritage Museum among others. Interview with award winner author Manny Pacheco. “Pacheco’s style is straightforward, unflinching and devoid of romance. In a world obsessed with fame and the bright lights of ‘show business,’ seeing these often troubled creative personalities without the smoke and mirrors of Hollywood glamour opens a new world for lovers of the cinema.This ‘Who’s Who’ of Hollywood’s character actors is a must-read for all serious fans of American cinema,” said Rich Follett book reviewer for Readers’ Favorite. Other talented award winners include Australian storyteller, Pamela McCagh author of “Sleep never comes for those that did not reach the other side.” Pamela inherited the gift to connect with the spiritual world from her mother and in her books she tells the stories of the spirits whom she connects with. “Each story will teach you about life. If you want to become a listener of the spiritual world you must meditate,’’ said Pam. Lance Johnson, author of “What Foreigners Need To Know About America From A to Z” received a gold medal award for this wonderful book about American culture, people, government, business, language and more. After reading Lance Johnson’s book I can say it was very well written and very informative. The outstanding delivery of topics on different people and cultures helps us to better understand the world we live in and each other to build a better place for all. If you enjoy reading an imaginative, inspiring and mystical story, Author Bryan Amodio is your choice. His latest book the “Looming Dragon” from “The DiujPa Series” took a gold award winning medal this year. “I always been fascinated with the Native American culture and the Old Testament,” said Bryan. Bryan’s novels merge the mystical world of the Native American culture with that of the Old Testament and create a rich and distinctive literacy work. Lori Costew author of Sherpa’s Adventures: Saving The Future is a great reductive book for kids who do not like to read. “I have two children and bullying is such a big issue. But kids don’t want to read about bullying, they want to read a fun, adventurous story that will entertain and teach them at the same time,’’ said Lori. Sheri Fink is a number one best-selling, award-winning children’s author, the creator of “The Whimsical World of Sheri Fink” children’s brand, and an international speaker. Sherry was very happy to receive two gold medal awards for her books “The little rose” and “The little Gnome”. Her books inspire and delight children while planting the seeds of self-esteem that can have lifelong benefit. “Exploring the Garden with the Little Rose,” written by Sheri Fink and illustrated by Mary Erikson Washam is a great book for teaching the alphabet. Sheri’s stories are enchanting and heartwarming. If you enjoy a good political thriller Steve Piacente’s book “Bootlicker” is the choice for you. “There is so much attention given to detail and the scene is so perfectly set that I found myself immersed into this setting and unable to put the book down,” said book reviewer Martina Svyantek. 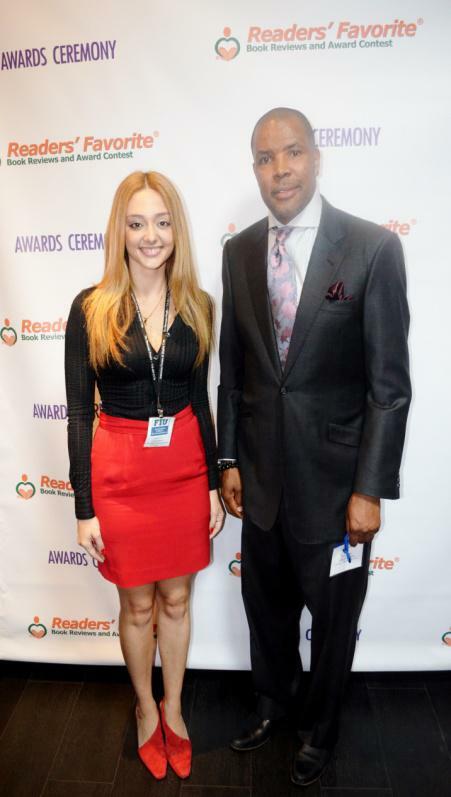 The entire team from Readers’ Favorite did an excellent job thorough the award ceremony. I hope to see more authors next year and be part of another ceremony filled with magic celebrating the literacy community.